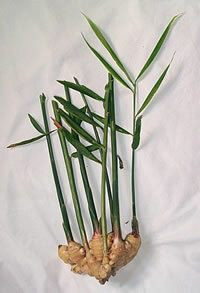 Description: Galangal – ginger-like rhizomes, and commonly used in Thai cooking as a flavouring. Ginger (Zingiber Officinale) is a tropical species native to Asia. The Zingiber genus includes a great number of plant species, of which about 80 are aromatic. Some of these are Australian natives, but the plant we normally think of as edible ginger is Asian. The part of the plant used is the rhizome, or underground stem. This is a clump of flattish handlike shapes with slim roots growing downwards from it, and the leaf-bearing stems growing upwards above the ground. The flowers are at the base of the plant, hidden by the leaves. While not as spectacular as some of the ornamental gingers, they are nevertheless very beautiful, though hard to see. Familiar to fans of Thai cooking, galangal is also a ginger-like plant, with the rhizome being used. This is a very spicy, hot taste, and just a little is needed, but the result is delicious, and unique.